Quick! Get your Delorean to 88 mph, ‘cause we’re going back in time. Back to when connecting dots and origami (read paper planes) helped us all get through those high school history classes. In Episode III, there is no revenge, nor are there any Sith; just some old school fun. So, get your hoverboards ready, as we’re pitting FDG Entertainment’s Paperama against Betaworks’ Dots. Dots is a matching game where coloured dots are connected. In Paperama, you digitally fold paper, origami style. But first, let me take a #selfie introduce our volunteers. In one corner, we have Cathy Li and in the other, Harry Yu. Both volunteers exhibited great perseverance and tenacity in playing the games. Cathy sacrificed many a tea time tête-à-tête with her girls, trying to line up as many squares as she could in an effort to better her personal high score in Dots; while Harry, in his dogged pursuit of the perfect whale (Paperama-Yama, level #15), began to display shades of Captain Ahab. 1. Which is the easier game to learn to play? Cathy: Dots. You cannot NOT learn how to play this game. It’s fun and simple. Harry: Yes, I’d have to agree. Dots is really simple to play. Paperama isn’t hard once you play it for a bit, but for sheer non-rocket science-ness, Dots wins. The score: Dots 1 - Paperama 0. Dots takes this round owing to its beautifully simplistic concept. 2. Which of the two games kept you playing for longer? Cathy: Hmmn. I picked up Dots really fast and it’s awesome, but the challenge does run out. Paperama has levels and criteria that I had to meet. So, when my paper-folded plane looked more like a sinking Titanic, it pushed me till I got it right. So, Paperama for me! Harry: Paperama, fo sho! It has levels and some of them are frustratingly difficult. But, it’s oh-so satisfying when you get the shape right. And the challenge heats up. Paperama’s thoughtfully designed levels keeps gamers wanting more and takes our score line to Dots 1 - Paperama 1. 3. On a scale of 1 to 10, which of the two games is the most satisfying? Cathy: Hmm. I love the musical note progression as you connect more dots. But Paperama is also very satisfying, with that beautiful white line outlining my creation. I’d say Dots 7, Paperama 8. Harry: Tough one. Dots, 7. Paperama, 7. This round: Dots 0.5 - Paperama 1. 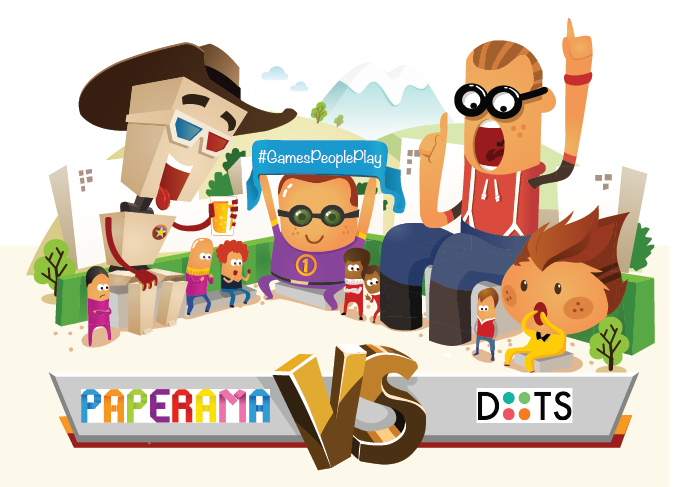 Final score: It’s Dots 1.5 - Paperama 2! Paperama’s engaging levels carry it to first place over Dots. And our nostalgic trip is sadly over. Time to get into the Delorean and head back. Back to the future.